A new book throws startling new light on how Britain went to war in 1914, and how it published a deceptive document to try and explain the decision: what the author calls “a dodgy dossier”. 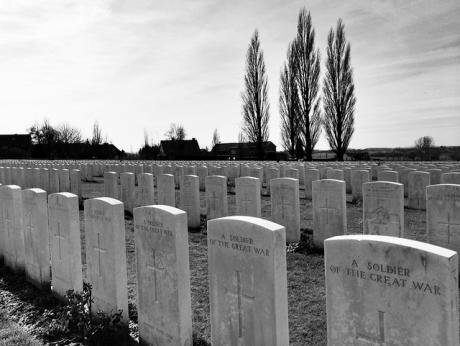 Tyne Cot cemetery, Belgium. Flickr/boagworld. Some rights reserved. The day after Britain declared war on Germany on Tuesday, 4th August 1914, the Liberal government decided to issue a White Paper justifying its decision. In his new book, “The Darkest Days: The Truth Behind Britain’s Rush To War, 1914” (published by Verso), Australian historian Douglas Newton argues passionately that an interventionist minority in the Asquith cabinet—Prime Minister Asquith himself, Foreign Secretary Sir Edward Grey, Lord Chancellor and former War Minister Lord Haldane, First Lord of the Admiralty Winston Churchill and Chancellor of the Duchy of Lancaster Charles Masterman—manoeuvred the large neutralist majority into siding with Russia and France against Germany as the crisis in European diplomacy reached its climax, five weeks after the assassination of Archduke Franz Ferdinand in Sarajevo on 28th June 1914. Newton’s fascinating book provides a startling close-up account of the last week before Britain entered the war, using private papers and a range of other documents to track the way in which the strongly anti-interventionist majority in the cabinet was steadily eroded by a mixture of wrong-footing, managed events and Asquithian persuasiveness, until only two of the four cabinet members who wanted to resign went ahead with their threat: and even they were induced to maintain silence over their reasoning once the decision for war had been made. John Burns, the Trade Minister, and Lord (John) Morley, Lord President of the Council, resigned after the cabinet on Sunday 2nd August. Sir John Simon, Attorney General, and Lord Beauchamp, Commissioner of Works, resigned at the cabinet on the following day. All were persuaded by Asquith to stay silent, in the “national interest” at a time of crisis (that the Conservatives were clearly willing to join a war-making coalition may have also influenced them not to rock their own party’s boat). After Grey had addressed the Commons on Monday 3rd August, a junior minister, Charles Trevelyan, also resigned. But Asquith successfully induced both Simon (whose reputation amongst radicals never recovered) and Beauchamp (who wrongly believing that Morley had relented, only to discover he was actually taking over his office) to rescind their letters. He also persuaded another radical leader, Lewis Harcourt, to stay in place, along with Jack Pease, Walter Runciman and the Chancellor of the Exchequer, David Lloyd George. By 1915, the Conservatives had joined the Liberals in coalition; by 1916, all the interventionist ministers (Asquith, Grey, Haldane, Masterman and Churchill) had been forced out of the cabinet, and Lloyd George had become Prime Minister, the more effectively to prosecute the war they had declared. Newton’s final chapters offer several unfamiliar vignettes: not least the “dodgy dossier”. The White Paper (“Correspondence Respecting the European Crisis”) purported to explain how an aggressive Germany forced Britain into the war. Newton demonstrates how this supposedly complete record was heavily doctored, yet also inadvertently revealed how dubious the British claims were. Of 159 numbered documents, eleven were described as having come from the British ambassador in St Petersburg, Sir George Buchanan. But ten of the eleven had been edited, without acknowledgement, whilst still bearing the label “telegraphic communication”. So a telegram dated July 25th omitted the belated admission by Buchanan that Russia had mobilised 1,100,000 men, nearly a week before Germany began its mobilization. Indeed, the published version added a misleading “if” to his advice that Russia felt ready to confront Austria: if “she feels secure of the support of France, she will face all risks of war”. Buchanan knew all too well that France and Russia were joined at the hip, not least in trying to conceal from Britain how they were carefully nudging Germany into taking the blame for starting the impending war. Suppressed was Buchanan’s advice to Grey that “we shall have to choose between giving Russia our active support or renouncing her friendship”. Also suppressed was Buchanan’s telegram of August 2nd, warning that, if Britain chose not to join the Entente Powers—Russia and France—we would “find ourselves without a friend in Europe, while our Indian Empire will no longer be secure from attack by Russia”. There was scarcely a mention of Russia in the brief Commons debates just before and just after the declaration of war: a subject understandably avoided by both front benches, given that Russian autocracy was a much bigger bogey amongst Liberal MPs than Prussian militarism, and that the Conservatives were as strongly committed to supporting France as the Asquith clique in the cabinet. Omitted from the package at the last moment—so late that the White Paper left a blank where document number 28 should have been—was Grey’s reply to Buchanan on July 25th, admitting that the Russian ambassador in London had rejected Grey’s proposal for a four-power conference to defuse the crisis. As Grey had made so much of the reluctance of Germany to agree to various formulations of this proposal, it was presumably deemed impolitic to reveal that France and Russia had also both solidly opposed Grey’s mediation efforts. One document that was included in the package, number 123, did cause some difficulty. Neither Grey nor Asquith, in their speeches to the Commons on August 3rd, 4th, or 6th, referred to a guarantee from the German ambassador in London, Prince Lichnowsky, on August 1st, that Germany would respect Belgian neutrality, and even guarantee the integrity of France and her colonies, if Britain stayed neutral. In declining this offer—as explained in a telegram from Grey to his ambassador in Berlin, Sir Edward Goschen—Grey had used the formula “we must keep our hands free”. The radicals in the cabinet who had done their best to force Grey to deal even-handedly as between the Central Powers (Germany and Austria) and the Entente Powers were furious to discover document 123, as Grey had never communicated Lichnowsky’s message to the cabinet. Indeed, even when Lichnowsky made an offer on August 3rd to guarantee not to attack the French coast (an issue which Grey insisted to both the cabinet and Parliament was a crucial concern of Britain’s), Grey described it to the cabinet as “personal” and “unauthorised” – despite it being confirmed formally in writing by the German embassy that day. Completely missing from the White Paper was Grey’s own kite-flying attempt to square the circle, whereby he proposed to Lichnowsky, also on August 1st, that if France remained neutral in a conflict between Russia and Germany, and Germany undertook not to attack her in any way, Britain would also offer to remain neutral. When news of this demarche arrived in Berlin, it had an electrifying effect. The Kaiser immediately instructed his Chief of Staff, Moltke, to halt the planned advance into Luxembourg, and transfer his forces to the East. Moltke, horrified by the likely chaotic outcome of such an inversion of his long-laid mobilisation plans, refused, and withdrew in a sulk. Later that evening, a telegram from King George explained that there had been a “misunderstanding”, and Moltke was told by his deeply disappointed monarch that “now you can do what you want”. There was, of course, no misunderstanding. Although the ever-polite Lichnowsky—the ultimate Anglophile—allowed a cover story to be told that the offer had been made during a garbled telephone conversation, there is no doubt about what Grey said, as he confirmed it in a cable to his Paris embassy that day. The problem was, as he was quickly made to understand, that France was bound by treaty to join Russia in any war against Germany, and was also required to mobilise in lock step with Russia. Either Grey was being remarkably thick, or he was spinning out the hours before the cabinet’s hand would be forced by events. Certainly, Germany must have realised from these exchanges that—if guaranteeing Belgian neutrality and even the French coast as well as all French territories could not secure British neutrality—there was little point in compromising its battle plans against a France determined to fight in support of its ally, Russia. The German declaration of war on France on August 3rd, followed by the ultimatum to Belgium, were (as Newton describes them) “heaven-sent” gifts to the Conservative newspapers clamouring for war, as well as to the Director of Military Operations, General Sir Henry Wilson, an Ulsterman who had encouraged Army officers to resist Irish Home Rule: war in France was a perfect opportunity to put Home Rule on ice for the duration. Even Grey was unaware of the elaborate extent or the detail of joint staff war plans agreed between Wilson and his French counterparts. If the radicals in the cabinet had known of it, there would have been uproar. Although in the end there were only the two resignations from the cabinet over Grey’s and Asquith’s handling of the crisis, most of the neutralists felt they had been jockeyed into war by Grey’s insistence that a secret agreement with France from 1912 on naval dispositions—which the cabinet had been told at the time in no way imposed obligations on Britain—required Britain to protect France’s northern coast if she undertook to move most of her navy to the Mediterranean in a war with Germany. Once that had been accepted, however reluctantly, on August 2nd, the neutralists recognized that if war came, the Royal Navy, at the very least, would be engaged. That, of course, was before the crisis over Belgian neutrality, where even the neutralists acknowledged British interests were closely involved. What they did not know, and what the sanitized White Paper also excluded, was that Grey had sent a message to King Albert of the Belgians urging him to resist any attempt by Germany to secure passage for its armies en route to France (something to which Luxembourg—whose neutrality was also guaranteed by a treaty to which Britain was a signatory—had already acquiesced). Later, in October, King Albert expressed his cabinet’s “resentment” at Grey practically giving “instructions to Belgium to defend herself”, when its preference would have been to “have permitted the Germans to go through upon guarantee that Belgian integrity would subsequently be respected”. As Grey and Asquith put it, Britain could scarcely be more Belgian than the Belgians: so they needed Belgium to fight. Even so, Britain’s declaration of war on the evening of August 4th was actually made before any request for assistance was received from the Belgians. Newton notes that, first, the five interventionist cabinet members decided to bring the expiry of the British midnight ultimatum forward by one hour. Then, even before the revised deadline, the King met with just three of the three hundred members of the Privy Council: the acting Lord President of the Council (Lord Beauchamp, who only two days earlier had resigned from the cabinet in protest at Grey’s lop-sided diplomacy); Viscount Allendale, Lord-in-Waiting; and the Earl of Granard, Master of the Horse. As the King noted, “I held a Council at 10.45 to declare war with Germany; it is a terrible catastrophy (sic), but it is not our fault”. Newton’s comment is caustic: “there was not one elected man among them”. Parliament barely discussed the decision to go to war, let alone having the right to approve it. Only much later were the inadequacies of the White Paper revealed. By the time the relevant volume of “British Documents” was published in 1926, it became apparent that in the Foreign Office archives five of the telegrams in the White Paper had actually been marked “Not sent – War”, with no further explanation. Four of the five were telegrams to Goschen. One of these was document 123. Douglas Newton is an unapologetic supporter of peace (he inscribed my copy of his book “with best wishes and hopes for peace”): and he is often scathing about those he despises (“Grey – a man without languages or drive or imagination – had been hopelessly ineffectual”). That does not detract from his scholarship or his conclusions. He has thrown new light on “dark days” indeed.